Murder by Gaslight: A Shrewd Rascal. Samuel Smith and his wife Emma appeared to the world as a happy and affectionate young couple. She was pretty and vivacious with a dazzling wardrobe and he energetic, with a winning personality. But beneath the surface was a hidden turmoil that did not come to light until Emma was found dead in their apartment, her head blown apart by a shotgun blast, with Samuel nowhere to be found. Emma Taylor Smith was beautiful girl of eighteen, with black hair and dark eyes. She was believed to be Spanish or a Creole from Louisiana but she was born and raised in Cleveland Ohio; both of her parents were mixed-race. Emma’s father had served two years in the State Penitentiary for burglary and larceny, and Emma herself had a brush with the law when at age thirteen, she accused an ex-policeman named Hoban of attempting a criminal assault on her. She met Samuel Smith in 1883 when she was fifteen years old, working as a waitress at Miller’s restaurant in Cleveland, and the two were immediately attracted to each other. Smith made and sold enameled letters for fancy signs and appeared to be earning good wages, but Emma’s mother was against the relationship because Smith was eight years older than her daughter. Two weeks after Emma’s sixteenth birthday, Samuel Smith called at the house, ostensibly to take Emma to a dance, but while Mrs. Taylor was distracted, they loaded Emma’s trunk onto a wagon and eloped. A few days later Mrs. Tayler received a letter from Emma, mailed in Buffalo, New York, explaining that she and Samuel were married and it would be useless to look for them. Samuel and Emma Smith then traveled to Chicago and while they moved quite often, they paid their bills and appeared to be a stable and loving couple. In November 1885, they were living in an apartment on West Monroe Street. The night of Saturday, November 23, the landlady heard an explosion come from their apartment and sent her husband up to investigate. Without opening the door, Samuel explained that he had been loading a shotgun that he kept for hunting and one of the shells accidentally exploded, but had done no damage. The landlord accepted the explanation then, but the next day, when no one answered his knocks he suspected trouble and forced open the door. He found the body of Emma Smith lying on floor with a pillow covering her face. He lifted the pillow to discover that the top of her head had been blown off. The murder weapon, Smith’s shotgun, was lying across the bed. Smith had changed out of his bloodstained clothes, washed his hands and left. Two letters found in the apartment prompted the police to believe that jealousy had been the motive for the murder. Both were signed by J. S. H. Bickford, one addressed to Mr. Smith, one to Emma. To Smith, Bickford explained that he had been engaged to marry Emma and had been led to believe that Smith enticed her from her home and compelled her to marry him. He followed them to Chicago with thoughts of revenge. Bickford related that one day when Smith was out of the apartment, he broke in and spoke to Emma, proposing that he and she fly away together. When Emma told him that she loved Smith with all of her heart and would never leave him, Bickford became angry and threatened to shoot Smith. At this Emma fainted. Bickford explained, “I took her in my arms and laid her on the bed and, God forgive me, I unbuttoned her dress, kissed her breast and pointed my revolver at her heart, but one word—Sammy—escaped her lips and arrested my hand.” Bickford resigned himself to the fact that Emma had chosen Smith and begged him to treat her well. To Emma, Bickford enclosed a lock of his hair because “Our eyes shall never again behold each other’s face.” He told her he was on his “dying couch” implying that he was committing suicide. Mrs. Taylor, who had come to Chicago to claim her daughter’s remains, knew nothing of J. S. H. Bickford and had no knowledge that Emma was engaged to anyone before meeting Smith. The police and reporters were not able to track down Bickford in Chicago or Cleveland and it was believed that the name may have been fictitious. Arrest for murder Samuel R. Smith. He is about twenty-seven years of age, five feet seven inches high, medium build, 145 to 150 pounds weight, dark brown hair which he combs low on his forehead and is slightly sprinkled with gray; has a tumor on top of his head and very receding forehead; scar through right eyebrow; small brown mustache, sometimes dyed black and curled up at ends; small, piercing eyes; talks rapidly; medium pale face; wore when he left here, dark, bottle-green suit with silver stripes, dark overcoat, small, leaf scarf pin with diamond in center, and high silk hat made by Chicago hatter. Address all information to F. Ebersold, General Superintendent Police. While police were having little success locating Samuel Smith, investigating reporters were learning quite a bit about his past. In Cleveland they discovered that Smith was not legally married to Emma Taylor, as he already had a wife. In 1881 he married Ella Hall in Erie, Pennsylvania, and together they worked on some lake vessels—he as a steward and she as a pastry cook. In 1883 they moved to Cleveland where Smith told his wife he was constitutionally opposed to hard work and believed he would live by his wits thereafter. He went to work for a man named Krusi who sold ointment and the porcelain letters Smith was selling when he met Emma. According to the real Mrs. Smith, Samuel brought Krusi to board at their house and before long had complete control of him. He stole between five and six hundred dollars from Krusi. Soon after, he sent his wife back to Erie, saying he planned to close his affairs in Cleveland and move to Buffalo; he would send for her when he was established there. In Erie she received a letter saying he was bound for New York City where he was to ship out as a sailor on an ocean vessel. He said he would return in nine months and live with her again. A year later she met a member of his family who told her that Smith had drowned in mid-ocean. Reporters also learned some particulars on the dead woman and her relationship with Smith in Chicago. The ruling passion of Emma’s life had been her wardrobe. The couple lived very frugally in every other aspect of their life so that Emma would have money for the clothing she desired. It was reported that on the Thursday before the murder she had demanded that Smith buy her a new silk dress and told him not to come home without it. She needed to dress well because she had decided to try her hand at entertaining and joined a West Side theatre troupe for a performance called “Lawn Tennis.” She proudly showed Smith some complicated dance steps she had learned for the show, but he was not impressed. The thought of her leaving him for the theatre, coupled with his jealousy over J. S. H. Bickford became unbearable for Smith resulting in Emma’s murder. But the murder had not been a sudden impulse; reporters determined that Smith had purchased a train ticket before the murder. After shooting Emma, Smith visited some men who owed him money, collected what he could, then by a roundabout route went to the train depot. Hours before the body was discovered Smith was in a sleeping car travelling though Canada. His final destination was unknown. On November 27, the Chicago Daily News received a letter postmarked Baltimore and signed by Samuel R. Smith, an analysis of the handwriting proved the letter to be authentic. In the letter Smith asserted that he had not deliberately murdered Emma. He admitted that he was jealous of Bickford, recounting the story of Bickford holding a gun to Emma’s breast, and he had been upset about her joining a theatre troupe, but the shooting had been accidental. He was loading his shotgun in preparation for hunting the following morning when the gun discharged, just inches from Emma’s head. The shot also broke the lamp, leaving the room in darkness. When Smith lit a match and saw what he had done he was devastated and nearly used the second barrel on himself. Instead he changed his clothes and left Chicago by train. After further reflection he realized he had nothing to live for and was planning to take his own life. He had sent the letter to the newspaper in a last attempt to set the record straight before dying. Love and cherish her for me. P.S. –You will find my body in the river—or in Chesapeake Bay rather. So fare thee well, all of my enemies. "A Chicago Wife-Killer." 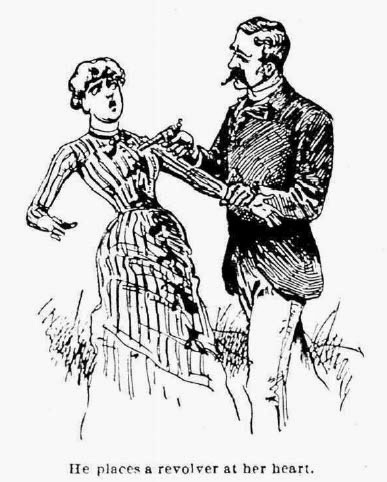 The National Police Gazette 12 Dec 1885. "A Former Lover." Evansville Courier and Press 23 Nov 1885: 1. "Covered Up His Tracks." Plain Dealer 24 Nov 1885: 1. "Emma Taylor's Death." 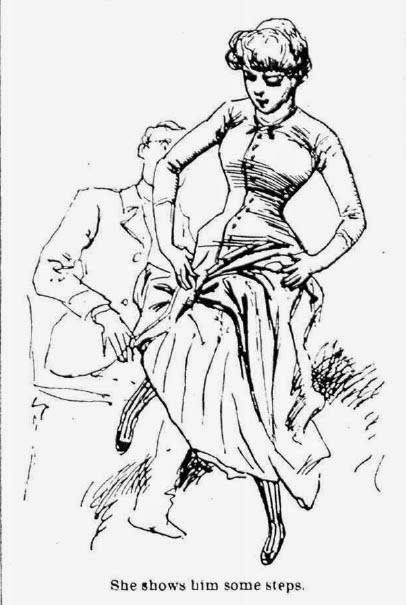 Cleveland Leader 25 Nov 1885: 8. 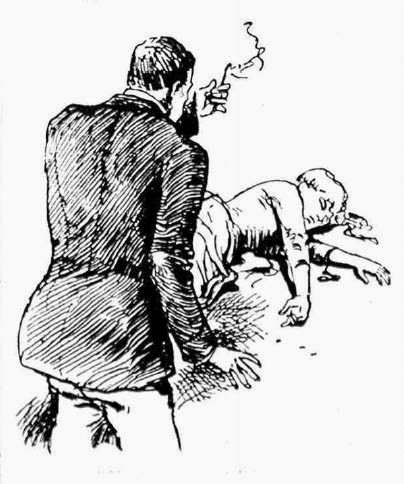 "Mr Smith Kills Mrs." Dallas Morning News 23 Nov 1885: 1. "Premeditated Murder." Cleveland Leader 27 Nov 1885: 8. "Pretty Emma Smith." Plain Dealer 25 Nov 1885: 8. "Smith's Legal Wife." 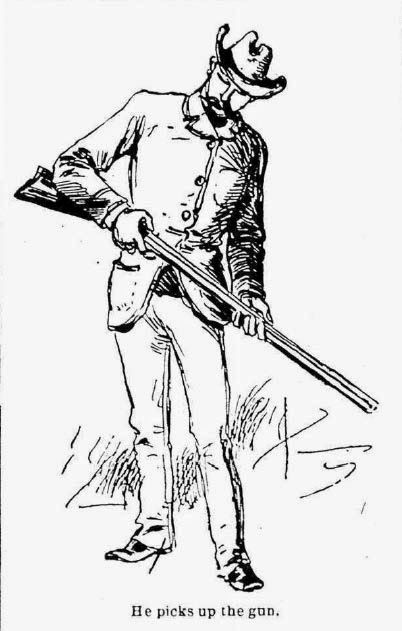 Cleveland Leader 26 Nov 1885: 8. "The Chicago Murder ." Plain Dealer 28 Nov 1885: 5. "The Fearful Fate of a Flirt ." Dallas Morning News 26 Nov 1885: 6.